You know how much I like my smoothies. Here is my latest offering The Mean Green Smoothie. I call it mean because of the kiwi fruit I added. Boy does it give it a kick! Kiwi are usually sweet with a bit of tang right? Juice it and it becomes a monster that hits you at the back of the throat. Not in an unpleasant way, but it does have a kick. Cooper really didn't like this one, but I love it! It's a mixture of greens and orange, which account for the sludgy swamp colour. 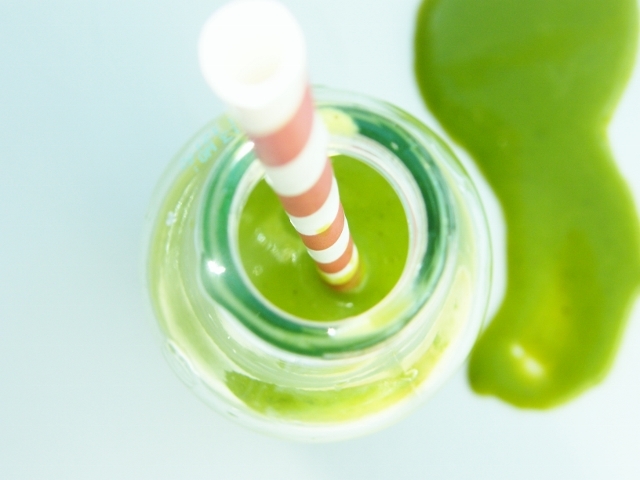 Sweet easy peelers, creamy avocado, sharp kiwi fruit, green spinach, orange juice, lemon juice and wheat grass. As well as being slurpilious and having a kick, it's super good for you. High in Potassium and very high in Vitamin A and C.
It's also only 71 calories a glass, so it's great for the 5:2 Diet. This is the first time I've used wheat grass in a smoothie. I was kindly sent a box of Wheat Grass Juice Powder by Pukka Herbs. They know how much I love my smoothies! Pukka Herbs specialise in Organic and Fairtrade Teas, but they also sell a great range of health products and skincare. I was more interested in their health powders, that could give my smoothies a zap! business men and women, stop in on their way to work for a shot of wheat grass juice. So, what's so great about it? "Wheat Grass Juice naturally supports the body's ability to cleanse itself due to its high chlorophyll content. It is one of the most nourishing foods in the world containing an easy to digest broad spectrum of vitamins, minerals, amino acids, proteins and antioxidants. To ensure optimum potency, we use only concentrated juice from fresh wheat grass." It's suitable for vegetarians, vegans and gluten-free diets and it only takes 5 minutes to make (add a couple more minutes if you have to blanch your spinach). 1. Wash your spinach. If you have a vitamix like me you can add the spinach fresh, if you don't, pop it in a colander in the sink and pour a kettleful of boiling water over it. Rinse with cold water to refresh, then squeeze as much liquid out of it as possible before adding to your blender or food processor.2. Prepare the rest of the ingredients. Peel the oranges and kiwi fruit, scoop the flesh from the avocado and juice have a lemon.3. Pop all of your ingredients into a blender and whizz until smooth. You can add ice if you like.4. Enjoy! I am entering my smoothie into Ricki's Wellness Weekends. To enter, simply link up a vegan recipe you made (and posted about) that contains health-supporting ingredients. fresh, real food is welcome! And check out my post on trying a vegetarian diet over at Baby Centre. 36 gorgeous starters, main courses and desserts to choose from. 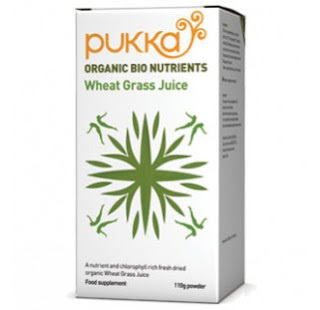 Disclosure: Pukka Herbs sent me a box of wheat grass juice powder to try. I was not required to write a positive review and any opinions expressed are my own. It is, but watch out how much kiwi you add, it does add a punch. I never thought of using it for that, but you are so right Claire. I will be drinking it on a fast day. Are you sure it was the kiwis that put Cooper off, and not the killer clown? You leave my sculpture out of itvAndrew & anyway, he isn't a clown, he's a dandy!!! Wow - what a colour! PS: re what you emailed me, no problem at all! I love the sound of this - I will give it a go soon. Just need to get hold of the powder! I do love Pukka teas, so I'm sure I will enjoy this, too! You can always try it without first. I just like the extra healthy boost the wheatgrass gives. I was recently asked to try a wheatgrass smoothie at work and it wasn't as bad as I imagined. 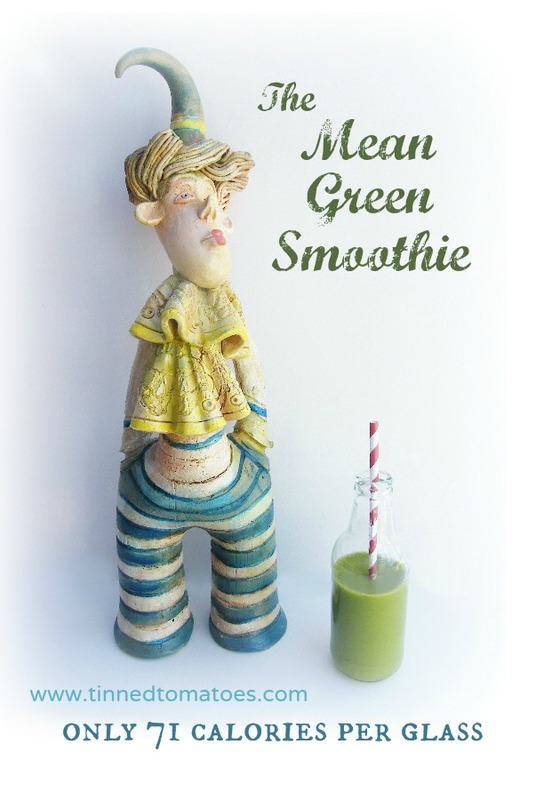 This sound delicious - I've been debating whether I should get a smoothie machine or juicer (I gave away my old smoothie machine) especially since the weather is warming up now. I have a juicer and don't use it. I would say smoothie machine. You can throw everything in. WOW. It's definitely... GREEN! I love kiwi smoothies, so this sounds good to me!